Clearly there is something magical about the Crocus sativus flower, from which the spice saffron is derived. If its striking beauty does not immediately cast a spell on its beholder, often it simply takes experiencing the spice to fall into full enchantment with it. This exotic spice has been used to treat more than 90 illnesses over 4,000 years. Here are just 8 healthy reasons to use more saffron. Age-related macular degeneration is on the rise. This ancient spice may save your sight. Saffron is again showing its healing abilities. Recent research finds it reduces heat shock protein antibodies and metabolic syndrome symptoms, along with stimulating immunity and cognition. Kava is safe and effective in treating anxiety disorders and depression. L-tryptophan is as effective as imipramine in treating depression. 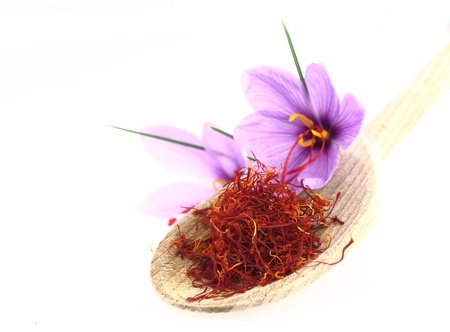 Saffron may be of therapeutic benefit in the treatment of mild to moderate depression and has similar efficacy as the drug imipramine. St. John's Wort is as effective as Selective Serotoin Reuptake Inhibitors (SSRI) in the treatment of Depressive Disorder, with a greater safety rating. Is The $34,000 Postpartum Depression Drug Injection Safe and Effective? The FDA’s newest drug approval for the postpartum depression begs the question: can patented drugs really provide a solution to a problem whose origins are not solely physical? As the baby-boomers age, blindness from age-related macular degeneration is on the rise. More than 3 million more people will become victims in the next five years. Eating right can lower your risk. Mental health disorders are often treated with harmful drugs with a myriad of dangerous side effects. Studies show that you can look to your kitchen instead of the pharmacy to ease symptoms of depression and anxiety safely and effectively. Low libido is a common complaint among women. It affects about 10% of women in the U.S., and up to 16% in Europe and Australia. Researchers are suggesting an ancient herb may provide relief.